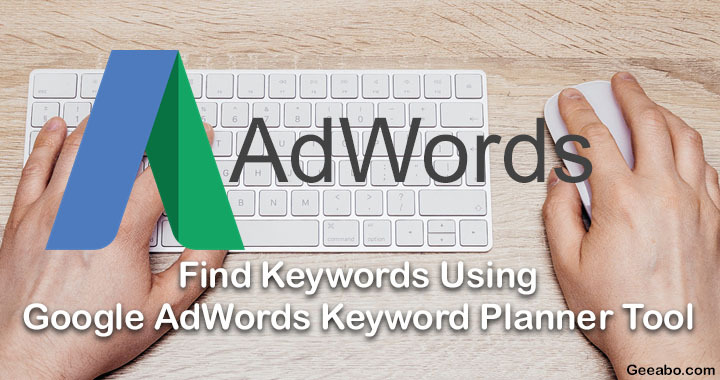 How To Find Keywords Using Google AdWords Keyword Planner Tool. Finding keywords in Google AdWords is quite simple and easy. Many of you ask me to write an article about the proper and easy guide to find keywords using Google Keyword Planner. As we all know that Google is the most popular search engine in the world. And every blogger or website owner wants to rank high in google. But without using best keywords this is tough to rank high quickly. So, Read this article till the end carefully to find the best keywords for your website to rank high and high in google as soon as possible. Hey guys, I’m Swapnil and I welcome you at Geeabo.com. In the Geeabo community you receive a new article every day. Where I tell you some important things about the world of Technology, Inspiration, Social Issues and much more. #Step 1. Login to your Google AdWords account. After Login, you will come to the Welcome to AdWords! page. If you do not created AdWords account earlier then simply Click Here to know the easy way. #Step 2. Now go to Tools and click on Keyword Planner. It will take a couple of seconds in loading and then you will come to the Keyword Planner page and it says Where would you like to start? Find new keywords and get search volume data. #Step 3. Click on “Search for new keywords using a phrase, website or category” and then enter the keyword which you wanted to rank high in google. And to know the actual traffic for the particular keyword in a particular time and then click on “Get Ideas” button. #Step 4. After click on Get Ideas button you can see the Average monthly searches and competition for the particular keyword. As per shown in the screenshot. Here I want to tell you one thing that if your website is new and you are a newbie blogger then use the keyword with low competition because it helps you to rank your article in google and every search engine.